I love outsider art. That's art made by artists unaware of or uninfluenced by mainstream conventions, or perhaps just unable to effectively mimic them. If you haven't been exposed, see if you can find a copy of Artistry of the Mentally Ill by Hans Prinzhorn, or check out Songs in the Key of Z by Irwin Chusid. But perhaps the most affecting piece I have every seen on the subject is the documentary Marwencol, about artist Mark Hogancamp. Mark Hogancamp was drinking in a bar New York State one evening when five men followed him outside and beat him nearly to death. As a result of his injuries Mark develops brain damage which virtually destroys his memories of his previous life. Then his insurance runs out, and Mark is unable to continue his rehabilitation therapy. To complicate matters further, while going through old journals Mark discovers certain aspects of his old life that disturb him. In an attempt to continue his rehabilitation, he constructs a 1/8 scale WWII era Belgian village in his backyard, which he populates with dolls representing himself, his friends, and his enemies. 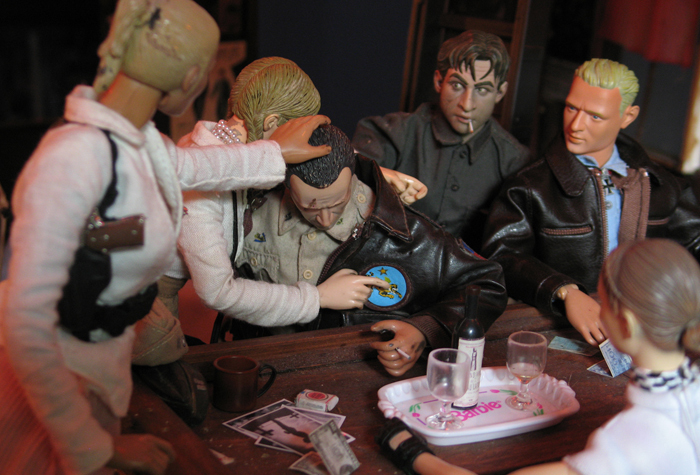 He names the village Marwencol, and uses it to stage dramas which eerie recall elements of his old life. He meticulously photographs these fantasies, which provide a record of his spiritual ups and downs. They also attract enough attention from the art world to get him a show in New York City. The documentary is a masterpiece of stranger-than-fiction storytelling, but most importantly, the art itself is incredible. As much as Mark's work is about a larger healing process, you're also looking at an artist who has absolutely got the goods. As one of the interviewees points out, Mark's work is almost completely without affect. He never smirks and he is never self-conscious when it comes to Marwencol, which I think many artists would consider a titanic achievement. The documentary is sensitive both to Mark's story and its pacing as a film, and deepens the strangeness at regular intervals. Just when you thought that was impossible.